So, you’re finally taking that much-awaited trip to France. Gearing up for the City of Love and the City of Lights, huh? C’est merveilleux! Better get started on your research then. Whether you’re going on a romantic trip or with the family and kids; planning to see the surreal sights in Paris or the quaint little towns, there’s plenty of resources in this site to help you. 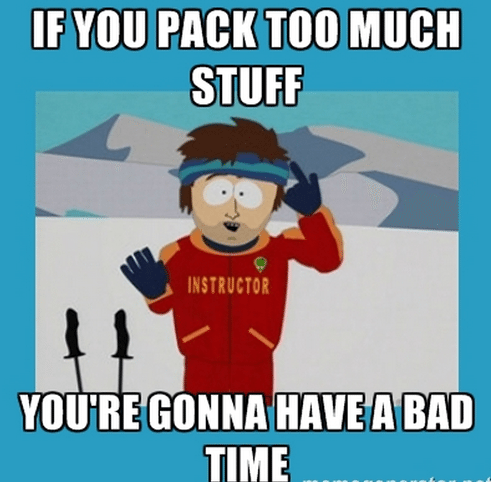 But before anything else, there’s the little matter about packing that needs to be taken care of. That’s one question that packs a punch (hah! pun intended). 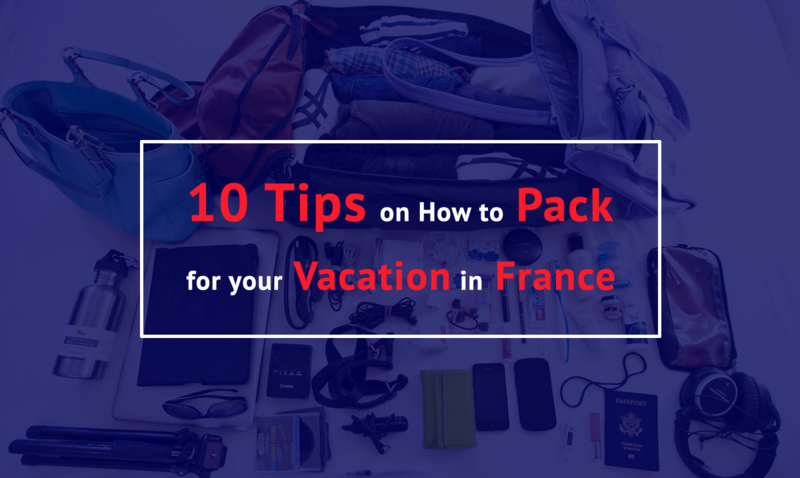 Packing for Paris might sound like such a daunting task, but you just have to carry on. Dang it, these puns just gotta stop. Anyway, going back to the task at hand, how do you pack the right things for a city known as the fashion capital of the world? You need to have all the items you need for a thoroughly enjoyable time, yet you do not want to overpack and turn your entire trip into an agonizing nightmare of dragging around a bulky luggage. So there’s the huge packing dilemma. But before you slump your shoulders in defeat, fear not, I’m here to make things easier for you. I’ve compiled a nifty list of all the tips you need to have an awesomely grand time in France. Listen to this meme guy. This meme guy knows what’s up. You could easily become one of the tired and disgruntled tourists who lug around bulky suitcases, carrying it up stairways – wheels and all – and clearly having a dreadful time. France, especially Paris, is full of stairs, smallish elevators, and lots and lots of walking. You would not want to be overburdened with two, or god forbid, three cumbersome suitcases. Your muscles would thank you for making a wise choice of packing light. Besides, if you are planning to visit more than one French city or going on a day trip outside Paris, most French train stations do not have lockers for you to stash your luggage in, so it’s going to be a most awful time of carrying up and down your luggage through the train platform’s staircases. I bet you’re shuddering at the thought already. I certainly am. <Insert epic shudder here>. But then again, packing light does not mean you’ll be arriving in France only to realize you’ve forgotten key items. Packing light goes hand in hand with packing strategically. So here are a few tips for that. For ladies, leave all those bulky jeans at home and instead, pack lightweight dresses. Dresses take less space, and looks chic, too! Wrinkle-free dresses are an even better option. If you’re not comfortable traipsing around Parisian streets with bare legs, tights or stockings underneath belted dresses or skirts are good. Lightweight pants work, too. Pack clothes that belong to a certain color scheme. This way, you can easily mix and match the items. Sticking to neutral colors would be ideal. Save precious space by re-wearing some items such as jackets, pants, or skirts. Leave those massive sneakers at home. Not only will they take up too much space in your luggage, it also screams “tourist!” in big, bold neon letters. Get a checklist ready and consult it often. You can download a checklist at the bottom of this article and refer to it as you pack. Forgo the unnecessary items on the list, add a few, and cross out items as you go along. Put a lot of effort into thinking what goes in the bag and what doesn’t. If it would be easier for you to buy the item in Paris, do so. But remember to pack a collapsible bag so that you can use it to stuff all the items you bought during your trip. So the age-old question stands: what do you wear in a place notoriously known for being extremely stylish? Simple: you wear whatever you want. Yes, really. You can wear whatever you think is comfy for you. Dress casually, but remember that the idea of “casual” in Paris isn’t nearly the same as how other parts of the world might define casual. To avoid feeling a tad bit underdressed and sloppy in a sea – or street – filled with stylishly elegant people, try to step it up a notch. This would mean staying comfortable while dressing up more elegantly than you normally would. The dress code in Paris is stylishly chic, tailored, well put together, and fashionable yet conservative. Dressing for Paris means none of those white bulky sneakers (unless you’re in Paris for some sporting activity), baseball cap, shorts, colourful patterned shirts, flip flops, and sweat pants. Leaving those at home would be a good idea, and you’ve probably read a few other articles waxing on and on about how you would stand out as a tourist when wearing the aforementioned items. Standing out as a tourist isn’t necessarily a bad thing, but it comes with disadvantages, too – like being targeted by a pickpocket, con man, or some other shady folks (yes, every city has those). That, and of course, the feeling of being too underdressed for the whole place which can be an unappealing thought. So why not give it a try? Consider it part of the whole happy experience. Besides, dressing up and grooming oneself is a sign of respectful behaviour in French culture. The thing is, dressing stylishly like any Frenchman or woman doesn’t require breaking the bank to shop for high-fashion, designer items. If you look closely, French people actually dress simply, but carry it with such flair and je ne sais quoi, plus a touch of well-placed accessories like belt and scarves, and a good comfy pair of (non-sneaker type) shoes. A rule of thumb: simple goes a long way. Black. Can’t go wrong with this color. Skirts and dresses for women. Shirts, trousers, dark jeans for men. Leave your ties at home unless it’s a business trip. Well-chosen accessories to spice up the ensemble. Weather in France could be tricky. One moment you’re experiencing a wonderfully sunny day and the next it will be raining cats and dogs. So make sure to check the weather prior to your trip. A compact umbrella in your tote bag could also come in handy. A key rule is to anticipate the weather and pack outfits based on the season when you’ll be travelling. Here are some essentials for each season. Much like the other seasons, spring in France can still be unwieldy and unpredictable, so wearing layers are a good call. Light sweaters, t-shirts, or long-sleeve tops would do for both men and women, paired with tailored pants or dark jeans. Dresses for women are always a good idea, especially ones in black or neutral colors. Bring accessories to spice up the outfit. 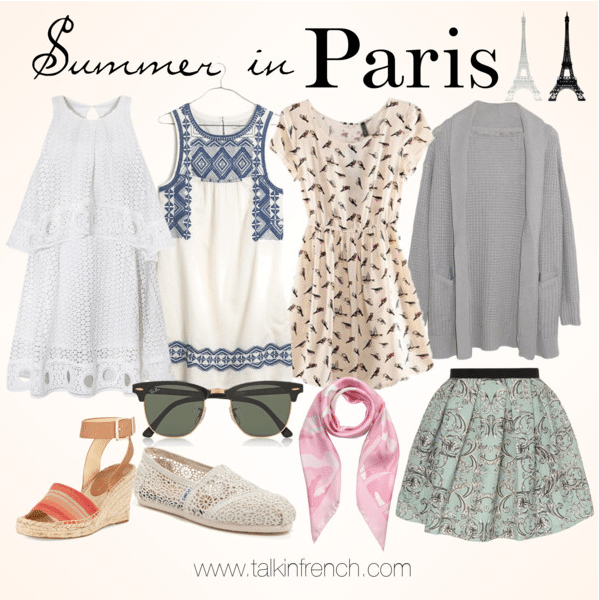 Parisian summers can be very hot especially in the afternoons, but it can quickly turn chilly, too. So must-bring items are light, breathable dresses (could be maxi dresses or cotton ones), summer scarves, a cardigan or light jacket to ward off sudden drops in temperature, and the ultimate daytime accessory: sunglasses. Alternatively, you can also opt for good dark colored jeans for the colder days. Did I mention short shorts for women? Nope. If you want to blend in, Frenchwomen do not generally wear shorts in public. If you’re planning to go to a resort, that might work, but then again, so will a dress. For men, lightweight khaki trousers, good jeans and light shirts should do the trick. Autumn in Paris, like the rest of the seasons, is like a beautiful yet unpredictable girl that you’re wildly crazy about: it is best to be prepared for all scenarios, but in the end, it’s always worth it. For women, it could be a good time to break out those leather clothing: a leather jacket or leather pants would be a perfect base for your autumn outfits. It is waterproof and keeps off the cold at bay. Dresses are fine but due to the temperature, it is wise to wear stockings or tights underneath. Trench coats work great too. For men, heavy knit sweaters, long sleeve shirts, or tweed jackets would do quite nicely with a good pair of trousers or jeans. 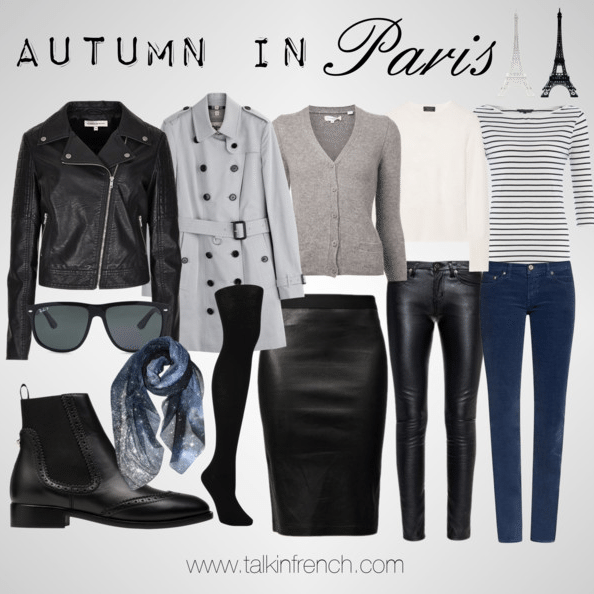 The French winter can be cold and wet and calls for sweaters, a warm coat or jacket, long sleeve tops, dark jeans, and thick trousers. Scarves and gloves are not only chic but more importantly, keeps off the cold, too. Boots are essential at this season, especially durable waterproof ones, as well as a waterproof jacket. For all the heavy-duty walking that you’ll be doing in France, comfy shoes are certainly non-negotiable. Keep in mind though that comfy shoes don’t mean you can’t be strolling in style. Pick a good, nice-looking pair that wouldn’t cause trouble for your feet. French people are great at choosing the right balance between comfort and sophistication. Loafers, brogues, and stylish boots are good all season-round, and for summer, comfy wedge sandals are nice for women. Remember, before packing footwear for your travel, test the heck out of those shoes first to make sure it doesn’t become a torture devise for your feet and ruin a perfectly good vacation. Depends on your preference, you can bring either a backpack or a rolling suitcase. Both have their own set of pros and cons. For example, a backpack can be easier to take up flights of stairs compared to luggage with wheels, but then you should opt for outfits that won’t wrinkle easily when choosing a backpack. Weigh the advantages carefully. For your daily frolic around town, you can use a sling bag that can be taken from day to night. This works for both men and women. A smallish backpack can be okay, too, but it could make it easy for pickpockets if you’re not too careful. For women, a tote bag or satchel can be good for carrying all the essentials. Plus you can tuck picnic items there, too. Dining is considered in France as a more formal affair. Upscale restos even implement dress codes, and even the not-so-fancy ones can still make you feel underdressed and dowdy if you don’t primp a bit. It is therefore important that you bring along dressier ensembles with matching dress shoes for men and more formal shoes (black heels) for women. For some strategic packing, make sure your shoes are smart enough to be taken from day to night. Prior to your trip, have some of your pocket money already converted to Euros. Upon arriving in France, you’ll need some euros to pay for your transportation to leave the airport and the currency exchange shops in the airport do not always offer the best exchange rates. Also, banks may charge higher for ATM withdrawals. Aside from the usual gadgets that you normally lug around everywhere (smartphones, music player, tablet), don’t ever forget to bring a good digital camera! Every little corner of this country is photograph-worthy, so bring enough memory cards, too. But on top of it all, remember to bring the all-important voltage adaptor and converter. This makes the difference between getting your gadgets fried or not due to the difference in voltage. Bring extra copies of your important documents such as passports, airline tickets, reservation confirmations, and all the necessary documentations. City maps are also important to bring, as well as your personal care items, your medications (bring some Tums in anticipation of all the eating that you will be doing! France is after all a food connoisseur’s haven.) Other stuff like bottle openers and champagne stoppers would also come in handy, but you can always pick it up once already in France. You’ve probably heard several tourists say that you should speak French when you’re in France. USA today even adds that if your French is not beyond beginner level, you should pack a phrasebook. Personally, I think it’s alright to speak in English as long as you are polite and use basic French words such as bonjour, bonsoir, au revoir, merci, and s’il vous plait. But if you want a truly enjoyable experience and enjoy France to the fullest, it is indeed better to speak French. A good and complete phrasebook will tell you exactly what words to say at the time you need it the most. 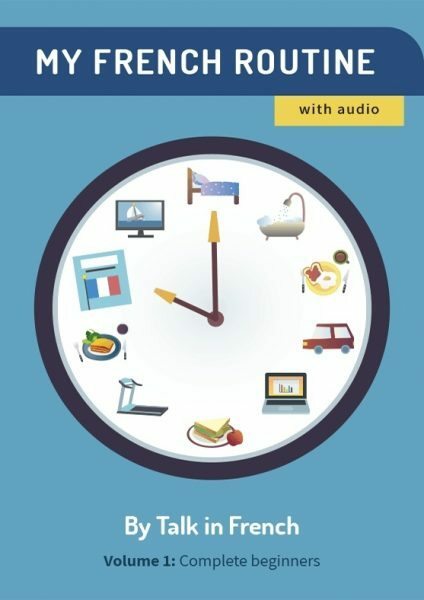 The best ones, like the one below, even have free audio that you can listen to to help you with pronunciation. And oh, did I tell you it comes with a menu reader, too? That way, you can enjoy an awesomely gastronomic travel experience in France without fumbling through the names of the exquisitely fabulous French dishes. For more details about this unbelievably helpful phrasebook, refer to the link above. You can also download a free checklist here to help you remember the important things to pack. Been to France already? What must-haves did you bring and what tips can you share? Sound off in the comments section. I’d love to hear your thoughts. To those who will be traveling soon, bon voyage ! Previous Post 10 Must-try French Wines for less than 10 Euros Next Post 4 Myths about Learning the French Language – Debunked!